It (and two other posts it links to) looks at two different types of sprawl of one which is not entirely bad (think Drury South industrial estate) and the other is (think most of the USA). Ben, Christensen is running a very specific essentially linguistic argument about the word sprawl. He is arguing he doesn’t find the word helpful in his battles, he is also clear that he is strongly opposed to almost all the things that are generally considered to be meant by the word sprawl, certainly in the pergoritive sense. Except one, the physical expansion of urban areas. Meh. That’s his prerogative. But clearly the word is still a useful shorthand for the negative aspects of this expansion. We could say we’re in favour of ‘good sprawl’ but that doesn’t really work does it? I often talk about ‘undifferentiated sprawl’ which is more precise but a mouthful. So it remains a useful term, a bit like NIMBY, everyone knows what it means, but it is not subtle. Personally I don’t like ‘smart growth’ or New Urbanism either, as they are both captured by a certain very specific American aesthetic. And anyway good design is neither exclusively new or smart; but timeless and normal. Autodependent patterns are the aberration. Or rather progressive sprawl (the addition of the Drury South Heavy Industrial complex (needed)) and unfettered Sprawl (Houston (not needed)). How’s that relevant to this post? I don’t think he used the word ‘sprawl’ once, just gave a lot of instances where the $/m^2 of suburban strip malls was hundreds of times lower than tiny buildings in dense areas. 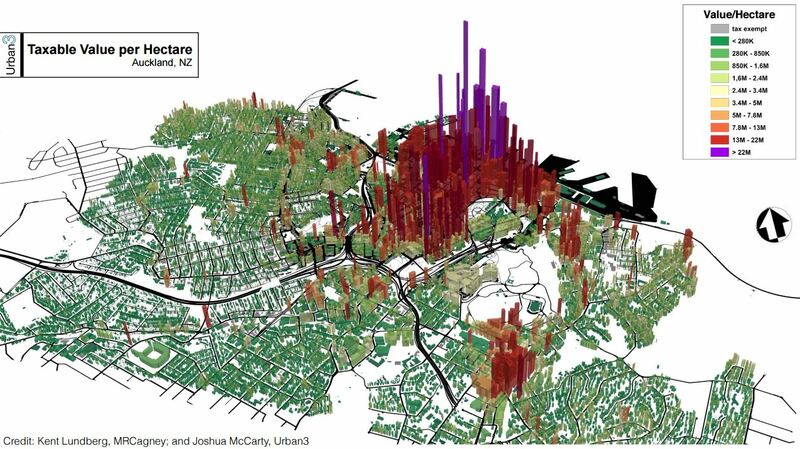 Because as the post and TB post show the consequences of sprawl (and intensification) which include land values and subsequently Rates collection vs Services expenditure. However like in the case of cough Warkworth cough where potentially up to 3 billion with 1.2 on that one rons on its own is being thrown at state highways to help facilitate it, it’s as they say in the south makes as much sense as a screen door on a submarine. How is it everything up to the last sentence makes sense? And then you spoil it all by writing the exactly wrong conclusion? Urban centres are great, efficient, highly effective environments that benefit the city. We should make it as easy as possible to create urban growth. By allowing it to happen urban growth has flourished much faster than ever before in all of our contemporary cities. Restricting sprawl increases costs, it is exactly the wrong thing to do. If you want lower rates, let growth happen. BTW – you’ll notice is there’s a huge contradiction between the rhetoric of some groups and councillors towards rates and debt, and the land use/urban polices they also promote. Yes, yes there is. To list the virtues of an urban environment, comment on these virtues in a possible manner and then conclude: that we need to increase land costs and make our urban centre as expensive as possible to build. Is to provide succinct evidence “there’s a huge contradiction between the rhetoric of some groups and councillors towards rates and debt, and the land use/urban polices they also promote”. At what point do you say that a city is beg enough and start a new centre of population and industry so you have a new area of agglomeration? Is that how new cities are born?